About 20min south of Nadi heading towards the Coral Coast, we discovered a great little place that caters specifically for surfers and divers. 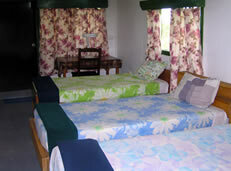 The Rendezvous Fiji provides simple, budget accommodation in the Momi area, close to the surf breaks and diving around the southern Mamanucas. Some of the places we visit fall into the "cheap and nasty" catagory. Rendezvous is certainly cheap, but it's anything but nasty... rooms and dorms are clean and comfortable, food is good, and perhaps best of all, the beer is cheap! The turn off to Rendezvous from the Queens highway is well signposted (see image) and from there, it's about 5km down a winding gravel road to the coast. If you arrive by taxi expect to pay around fj$50 from Nadi airport. 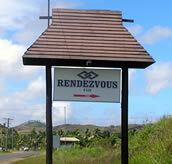 Rendezvous can arrange a transfer for you if you wish. For those that prefer to save transfer money, a local bus from Nadi will cost about fj$1-2, and can drop you off at the rendezvous signpost. From there, arrange to get picked up by someone from the lodge. The rates are cheap for what you get... we looked at all of their accommodation while we were here, and everything was extremely clean and well maintained. Dorms for guys and girls are separate, and the one that we saw had 4 single beds. The dorms are fj$45 a night, the most expensive cabin (with ensuite and A/C) is fj$166 a night, with various levels of accommodation in between. Surfing - this is the whole point of coming to Rendezvous, in our opinion. There are seven top class surf breaks in the area... most famous of which is "Cloudbreak". The lodge works in with one of Fiji's top surf companies, Fiji Surf, to get you out to which ever surf spot is going to be best for that particular day. All you do is let the guys at Rendezvous know that you want to surf the next day, and they will arrange for Surf Fiji to call in with their boat to pick you up the next day. Departure times and which break you will be going to varies depending on tides, wind direction etc. They choose what's going to be best for that day. You can hire everything from Fiji Surf - boards, wetsuit etc, or bring your own. These guys are Fiji's #1 surf company, so they have top class gear, and know the local conditions better than anyone. You can read more about them on their website. Diving - If diving is what you're after, Rendezvous work with Whitetip Diving to get you out to some of the best Mamanuca dive sites. From beginner to advanced, they also offer instruction and short dives for those that haven't yet tried diving, but would like to give it a go. If you have ever used the S.S.C catamaran (Tiger 1V) to travel around the Mamanucas, you will be aware of how expensive it is to travel on it. For example, Denarau to Malolo (or vice versa) will cost fj$115, one way... and that only gets you to their drop off/pick up point offshore. As Malolo is reasonably close to the mainland, only a 45min trip at most, we don't see why it should be so expensive. Fuel isn't cheap in Fiji, but even allowing for the exchange rate it's pretty close to the prices in NZ and Australia. When we want to get out to the Mamanucas, we simply refuse to pay exorbitant prices. Unfortunately, tourists don't really have a choice as it can be difficult to track down cheaper boat transport from your hotel/resort. 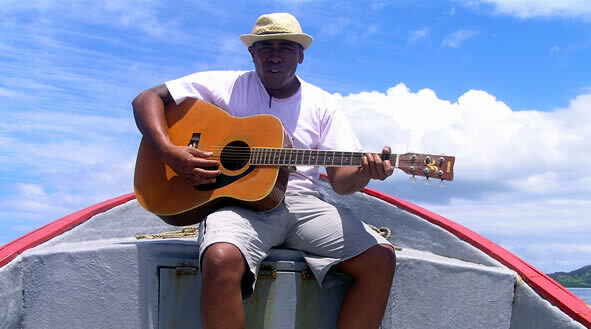 So we have a mission at the moment...track down good cheap and reliable alternatives for trips to the Mamanuca and Yasawa islands, and let you know about them. Prices per person start at fj$125 for 7 or more passengers... the more of your friends that go with you, the cheaper the trip! For 3 people, the price would be fj$200. And that is still cheap! If you want to book either accommodation, the Malolo day trip, or simply find out more information, please use the contact form provided below. Note: Your inquiry will go directly to Rendezvous, and you can expect to receive a reply within 24hrs.